As the mother of nine children with ages ranging from 16 months to 16 years… there have been many (many, many…) times that I have cringed with embarrassment at their behavior in church. ( Refer back to my previous blog titled “Being a good example…”) Don’t get me wrong the upper 66% of the kids are quite well-behaved in church. It’s the lower 33% that causes the problems. Lucky for them they are really stinkin’ cute! Anyways…back to the point of this blog. There are, on occasion, times when I have beamed with pride at one (or more) of my crew and last Sunday was such a time. ( I figured to balance out the blog posts that bring attention to the not so shining moments, I definitely wanted to draw some attention to the kiddos when they do something good. ) 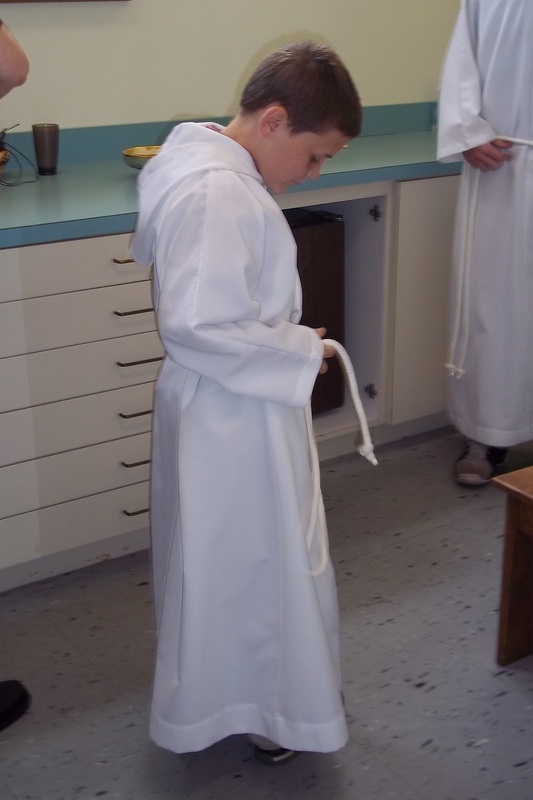 Isaac has been waiting patiently…(ok not so patiently) to FINALLY become an altar server in church. In our church the altar servers are required to be in fourth grade. Guess who is finally in 4th grade! He received his training a month ago and served his very first mass last Sunday. I was so proud of him! He was very anxious but the fact that he was serving with his big brother, Jake, eased his nerves. I have to admit that I was nervous too. He just seemed so little, too little to be dressed in an alb. I had taken my camera to church with me (don’t laugh!). Brian wouldn’t let me take any pictures during mass, but I did sneak back into the sacristy to snap a couple of pictures before mass. Here is Isaac getting dressed. He did a great job! He remembered everything that he was supposed to and he looked like a pro! I never would have known that it was his first time to serve if I hadn’t been acutely aware of how terrified that he was. Being his mom, I knew how nervous he was, but he never let it show. 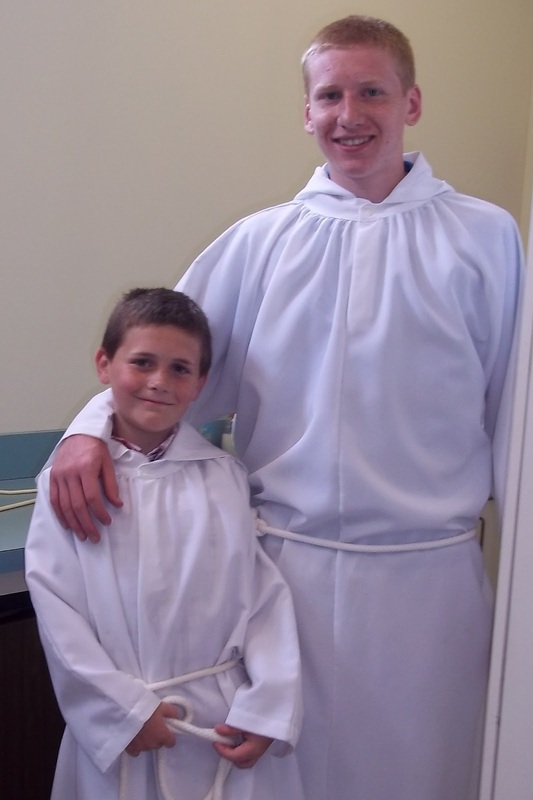 I was beaming with pride at my new altar server. I have to admit that I even teared up. That makes four of our kids that have chosen to serve at mass. It is a commitment that should not be taken lightly. Being an altar server brings a new awareness to the intricate beauty that makes up the mass. The altar servers become a part of the tradition that IS the mass. They are not only witnessing the mystery of the mass, but they participate in it. It is truly an honor. Being a mother to 6 boys, I have to admit that there is a part of my heart that prays that one of my boys will be blessed with the call to a vocation in the priesthood. For the last few years Isaac has proclaimed his desire to become a priest… well, either that or a professional athlete. 🙂 He has conducted mass in our basement complete with robes and vestments. He begs his brothers and sisters to “Play Church” with him and has trained Noah to be his altar server. He even has cruets to hold the water and “wine.” In art class this past year, he even made a chalice to use and had his teacher glaze and fire it so that he can actually drink out of it. I know that he is still very young and that it is quite possible that he will change his mind. But I also know that he has opened his heart to the possibility. I truly feel that if God does call him to the priesthood, Isaac will have a heart that is waiting and listening. That is the desire of this mother’s heart. What else could you ask for?